British poet and leading figure in the Romantic movement (1788-1824). 3 letters signed (two as "Noel Byron, Pair d'Angleterre", one with initials). Genoa. 4to. Altogether (¾+¾ =) 1½ pp. on 4 ff. With integral address-leaves. 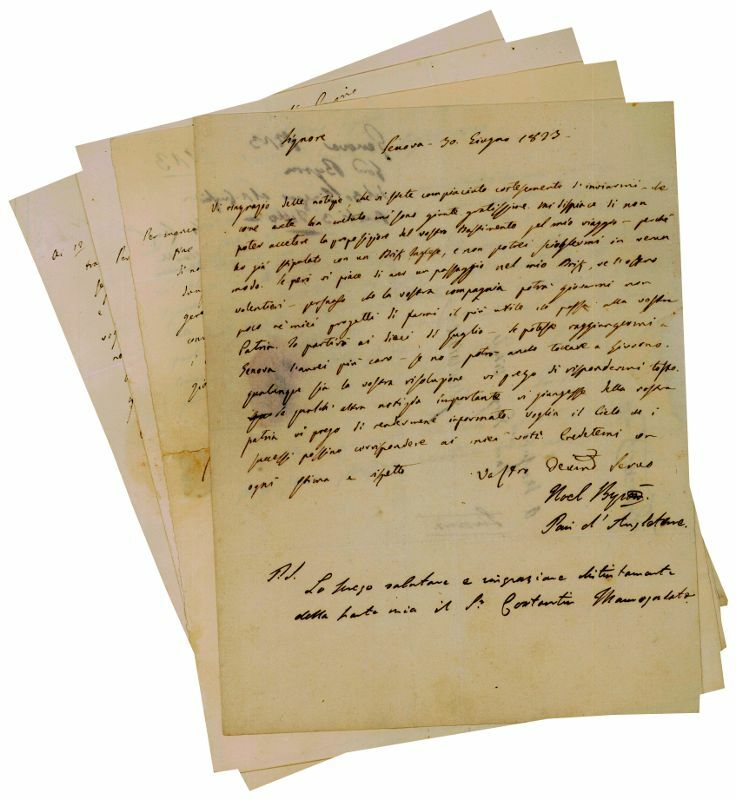 These three evocative letters, written in Italian and in the hand of Count Pietro Gamba (the brother of his beloved Teresa Guiccioli), were written while Byron was making his final preparations for his voyage to Greece, where he was to die nine months later "that Greece may still be free". Their addressee is the Greek patriot Giorgio Vitali (1776-1854) at Leghorn, from an ancient Venetian family and the commander of the Ionic vessel "Hercules" that Byron wanted to take. (I) In the first letter (July 7), Byron is rescheduling his departure to July 12: "[...] Capisco che il momento del forte conflitto è giunto [...]". (II) In the second (July 9), stating that in order not to lose a moment of his time, he has resolved not to make a stop at Leghorn except to take him on board along with an other English gentleman (James Hamilton Browne), and asking Vitali to tell his compatriots to have any despatches and instructions relating to his mission ready for his arrival. (III) In the third (July 12), delaying his departure until July 14, and telling Vitali that by passing through Leghorn they should not drop anchor in order to avoid pointless expense and waste of time. - Byron was to bid farewell to Teresa and board the "Hercules" on 13 July, the day after writing the last of the present letters. However, his departure was to be delayed by calms, and then a storm. By some accounts, his mood at this time was despondent, almost fatalistic. During the delay he went on shore again to visit the house outside Genoa that he had shared with Teresa; as her brother recalled: "His conversation was somewhat melancholy on our way to Albaro, he spoke much of his past life, and of uncertainty of the future, 'where', said he, 'shall we be in a year?'" (quoted by Leslie A. Marchand, Byron: A Biography  III, 1089). They eventually set sail from Genoa on the 16th. During the couple of days spent at Leghorn, Byron received a verse-tribute from Goethe and dashed off his famous reply: "I sailed from Genoa some days ago - was driven back by a Gale of Wind - and have since sailed again - and arrived here (Leghorn) this morning to receive on board some Greek passengers for their struggling country" (22 July 1823). They set sail once again on 24 July, and finally reached Cephalonia on 2 August. - These letters are not published in Marchand's edition of Byron's Letters and Journals (1973-1994). Each with small seal-tears, otherwise in fine condition..
British poet and leading figure in the Romantic movement (1788-1824). Letter signed (with initials). Genoa. 4to. ¾ p. on bifolium. With integral address-leaf. 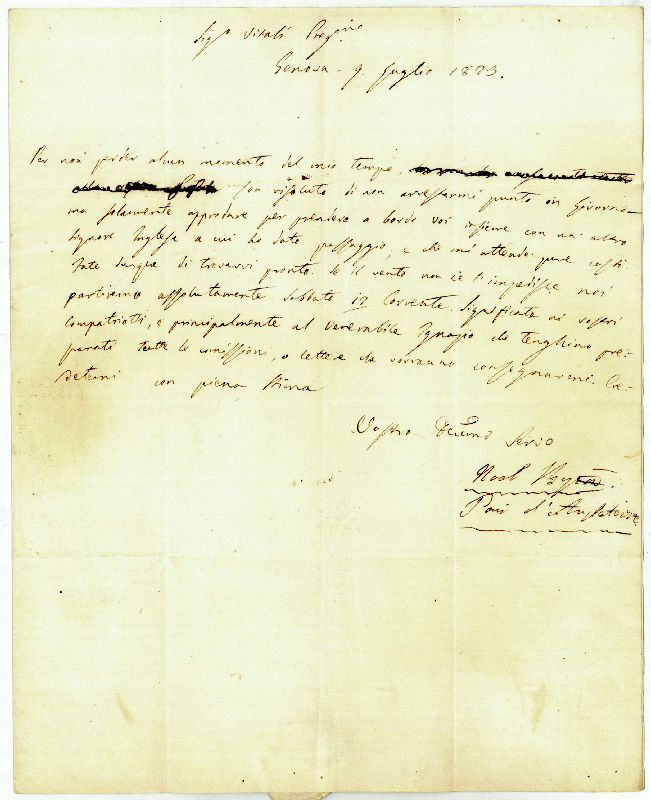 The present letter, written in Italian and in the hand of Count Pietro Gamba (the brother of his beloved Teresa Guiccioli), was written while Byron was making his final preparations for his voyage to Greece, where he was to die nine months later "that Greece may still be free". Its addressee is the Greek patriot Giorgio Vitali (1776-1854) at Leghorn, from an ancient Venetian family and the commander of the Ionic vessel "Hercules" that Byron wanted to take. Byron is delaying his departure until July 14, and tells Vitali that by passing through Leghorn they should not drop anchor in order to avoid pointless expense and waste of time. 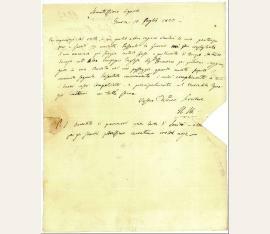 - Byron was to bid farewell to Teresa and board the "Hercules" on 13 July, the day after writing this letter. However, his departure was to be delayed by calms, and then a storm. By some accounts, his mood at this time was despondent, almost fatalistic. During the delay he went on shore again to visit the house outside Genoa that he had shared with Teresa; as her brother recalled: "His conversation was somewhat melancholy on our way to Albaro, he spoke much of his past life, and of uncertainty of the future, 'where', said he, 'shall we be in a year?'" (quoted by Leslie A. Marchand, Byron: A Biography  III, 1089). They eventually set sail from Genoa on the 16th. During the couple of days spent at Leghorn, Byron received a verse-tribute from Goethe and dashed off his famous reply: "I sailed from Genoa some days ago - was driven back by a Gale of Wind - and have since sailed again - and arrived here (Leghorn) this morning to receive on board some Greek passengers for their struggling country" (22 July 1823). They set sail once again on 24 July, and finally reached Cephalonia on 2 August. 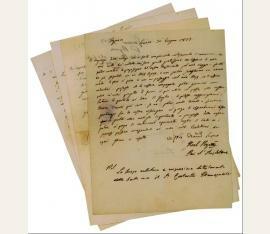 - Not published in Marchand's edition of Byron's Letters and Journals (1973-1994); small clipping from opening the letter (slightly touching text); overall in fine condition..
British poet and leading figure in the Romantic movement (1788-1824). 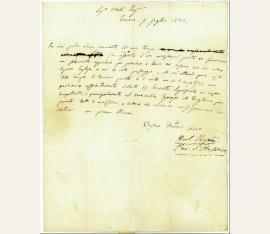 Letter signed (as "Noel Byron, Pair d'Angleterre"). Genoa. 4to. ¾ page. Bifolium with integral address-leaf. 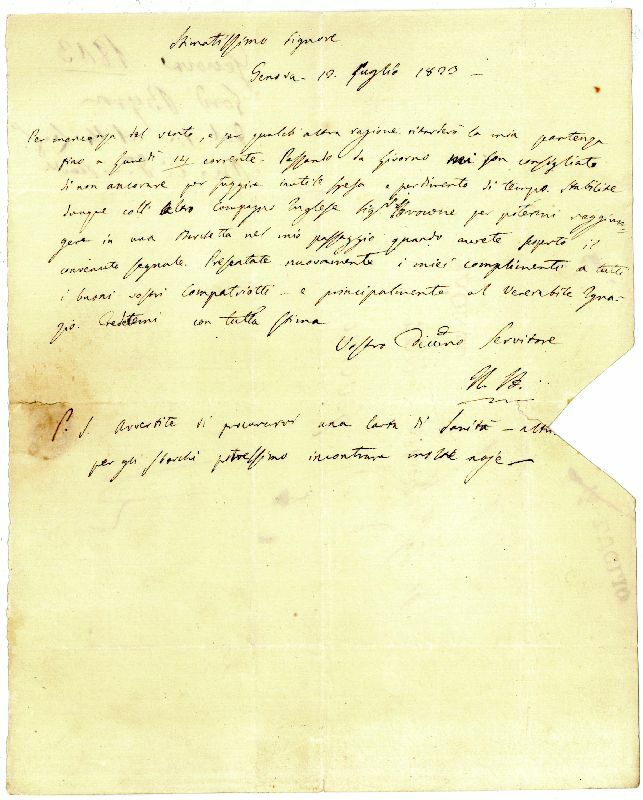 This evocative letter, written in Italian and in the hand of Count Pietro Gamba (the brother of his beloved Teresa Guiccioli), was written while Byron was making his final preparations for his voyage to Greece, where he was to die nine months later "that Greece may still be free". The recipient is the Greek patriot Giorgio Vitali (1776-1854) at Leghorn, from an ancient Venetian family and the commander of the Ionic vessel "Hercules" that Byron wanted to take. Byron states that in order not to lose a moment of his time, he has resolved not to stop at Leghorn except to take him on board along with another English gentleman (James Hamilton Browne), and asks Vitali to tell his compatriots to have any despatches and instructions relating to his mission ready for his arrival. - Byron was to bid farewell to Teresa and board the "Hercules" on 13 July. However, his departure was to be delayed by calms, and then a storm. By some accounts, his mood at this time was despondent, almost fatalistic. During the delay he went on shore again to visit the house outside Genoa that he had shared with Teresa; as her brother recalled: "His conversation was somewhat melancholy on our way to Albaro, he spoke much of his past life, and of uncertainty of the future, 'where', said he, 'shall we be in a year?'" (quoted by Leslie A. Marchand, Byron: A Biography  III, 1089). They eventually set sail from Genoa on the 16th. During the couple of days spent at Leghorn, Byron received a verse-tribute from Goethe and dashed off his famous reply: "I sailed from Genoa some days ago - was driven back by a Gale of Wind - and have since sailed again - and arrived here (Leghorn) this morning to receive on board some Greek passengers for their struggling country" (22 July 1823). They set sail once again on 24 July, and finally reached Cephalonia on 2 August. - In fine condition..